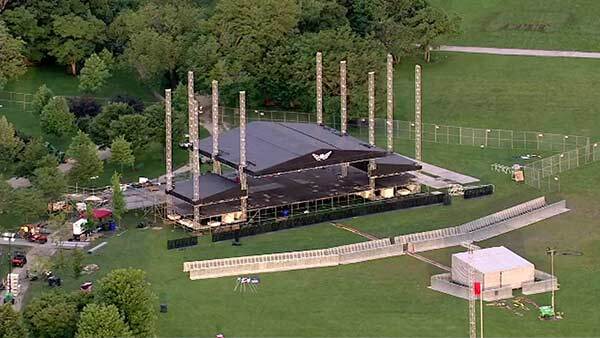 CHICAGO (WLS) -- Wednesday's sold-out Mumford and Sons show at Montrose Beach has been postponed until Friday. "Despite huge efforts against really unfavourable weather, the local promoters have been unable to build us a stage in time for the show tonight," the band posted on its Facebook page. "It takes a lot for us to pull a show, it's something we try to avoid at all costs, but tonight it's just not going to happen. Of course we are devastated." The band added that refunds are available for those who now cannot attend. JanUSA released a statement saying "dangerous" and inclement weather beginning Monday, including "several consecutive days of rain," kept the crew from being able to work on constructing the stage. The concert could still cause headaches for drivers and commuters Friday; the venue has no parking for the anticipated tens of thousands of concert-goers. With an estimated 35,000 to attend, there will be increased pedestrian traffic as well. Pedestrians are urged to use the Montrose, Wilson and Lawrence underpasses to get to the event. The city says concert-goers are urged to use public transportation, walk or bike to the venue since no parking is available for the show.